This entry was posted in 1940's, A Peek Down Below, Launches, Non Waitemata, Tales & Yarns and tagged El Alamein, Lake Rotoiti, Lake Taupo, Mac McGeady, Ranui by Alan Houghton - waitematawoodys.com founder. Bookmark the permalink. Ranui has a new home. She is now resides on the beautiful Hokianga harbour, Her new owners, Siobhan Hall and Dimitri Edmonds have kept her in survey, where Ranui will extend the Coast to Coast cycle trail that currently ends in Horeke. Ranui will ferry a cyclists and their cycles on a comfortable and scenic trip across the harbour to either Kohukohu or Rawene, both historic settlements in the far north. Hi Paul, do you or family happen to have any photos of those days you went out on El Alamein as a boy or any other photos of her? May I extend on behalf of my family our sincere thanks to Jamie and Sarah Looner for their continued perseveration of this motor vessel that back in the 1950’s and early 60’s bought some much please to me as a small boy. Amongst the vessel’s former owners was my family’s cousin Noel East who would take us out on the lake for a weekend’s fishing expedition. Where after a day’s fishing he’d pull into one of those remote western bays for the night, a BBQ on the lake shore, a small drift wood fire going and the smell of freshly cooking trout. What wonder memories you have bought back as I read through the history of a motor launch I knew as the “El Alamein”. My understanding of its name (from memory) I recall my parents asking Noel why the launch was called the El Alamein. In his reply he said he’d named it after the famous North African battle, which seemed to have held some significance for him. Perhaps he may have been at that battle himself or had a relative who fought there. As an aside Noel East was almost 100 years of age when he died in Tauranga Hospital on the 6th Jan 1999. 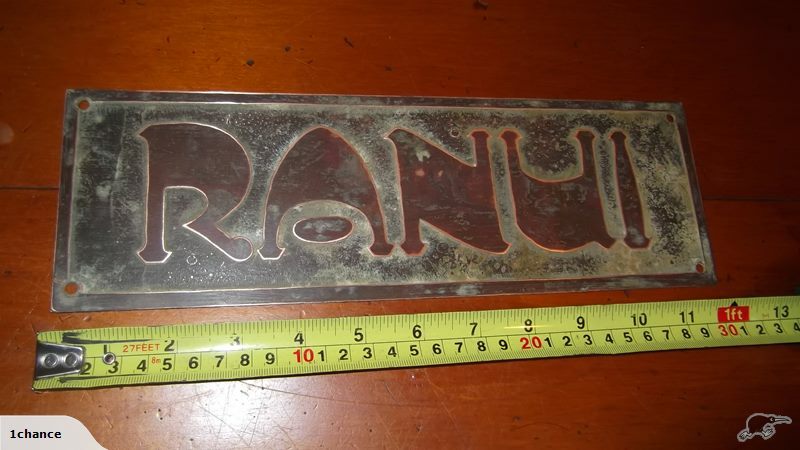 By strange coincidence, the name “Ranui” also has an association with my extended family in that they call their property on the Western Hills of the Hutt Valley “Ranui”. Oh well that’s better than a poke in the eye.!!! Pam’s sign is in an art nouveau font which puts it around 1900. My guess is that it’s a house sign for a 1900-period villa. EL ALAMEIN retained her name for a long time after arriving at Taupo. I think it was probably Jim Storey who changed her name to RANUI.